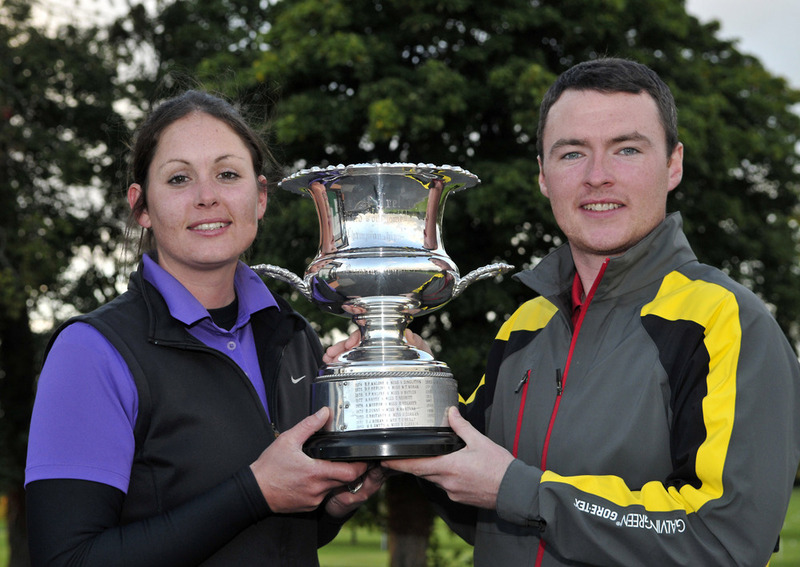 Niall Gorey (Muskerry) and Gillian O’Leary (The Island) congratulate Maria Dunne (Skerries) and Eoin Arthurs (Forrest Little) on the 18th green after their victory in the 2013 East of Ireland Mixed Foursomes Championship at Craddockstown Golf Club (15/09/2013). Picture by Pat CashmanSkerries’ Maria Dunne shook off the fatigue of a long week representing Ireland in the Home Internationals when she teamed up with Forrest Little’s Eoin Arthurs to retain the East of Ireland Mixed Foursomes Championship title at Craddockstown on Sunday. The Championship was first played in 1974 and won by Brian Malone and Valerie Singleton. Other past winners include Padraig Harrington with Eavan Higgins in 1992, Eddie Dunne and Mary McKenna and Eddie and Eileen Rose Power.